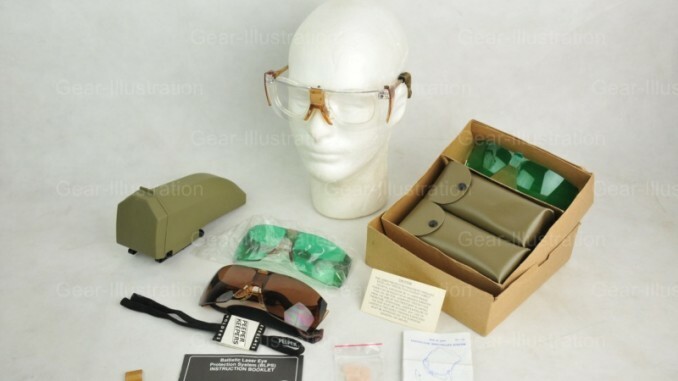 The BLPS effort was initiated by the Medical R&D Command in 1986, based on a requirement (SN-CIE) for ballistic and laser eye protection approved in 1984. The BLPS were Type Classified-Limited Procurement/Urgent in 1989 and fielded during Desert Shield/Storm. The BLPS were product improved by Natick RD&E Center based on User feedback and re-evaluated 1991-1994. The BLPS system consists of multiple spectacle assemblies available in clear, sunglass, two wavelength laser protection, and 3 wavelength (l) laser protection. Laser protection is provided by using dye absorber technology. The BLPS accommodates a prescription lens insert via a nosepiece carrier for soldiers requiring corrective lenses. All lenses are ballistic protective and are capable of defeating a 5.8 grain, T-37 shaped fragment simulating projectile at 650 feet per second. The BLPS are designed to accommodate the 5th percentile female to the 95 percentile male in one size. A hard carrying case is available that accommodates one complete spectacle assembly. The improved BLPS successfully completed evaluation and was Type Classified-Standard in May 1995. Contract award for production of BLPS was 3QFY96 and First Unit Equipped is scheduled for 4QFY98. BLPS clear and sunglass configurations will be central fielded to Force Packages One and Two. All configurations will be available for procurement through the Defense Supply Center, Philadelphia (DSCP) after FY00.